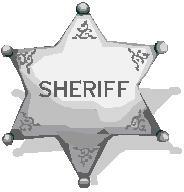 The word sheriff comes from the Anglo-Saxon term, shire reeve. The following definitions are found in the 1913 Webster Dictionary. Reeve n.1.an officer, steward, bailiff, or governor; used chiefly in compounds; as, shirereeve, now written sheriff; portreeve, etc. processes, and the preservation of the peace. A sheriff is elected by the people, he works for the people. He is the ONLY elected Law officer of the county, as such he is the Supreme Law officer of the county. He is accountable to “We the People”. Within the boundary of his county the sheriff has more power than the President of the United States. The following example illustrates the power of a sheriff. The Bureau of Alcohol, Tobacco, and Toilet Takers (AT&TT) come to your county and declare it is now illegal to own a toilet. “They” will be removing all toilets from the county this week! The people say; “We don’t want you to take our toilets, we like our toilets.” The AT&TT say; “Too bad we are here to take them!” After some debate about the fact that the Constitution does not prohibit the owning and use of toilets, but instead protects the private ownership of property; thus we are free to have them; the sheriff is called. The people explain to the sheriff the situation and remind him that it is not against the Constitution to own a toilet, and he needs to step in and make “them” go away. It is the responsibility of the Sheriff to protect the people. He has sworn an oath to do just that! He works for the people! He, as the Sheriff, has the power and authority given to him by “The People”, to tell the ‘Toilet Takers’ that ”The People have spoken, they will be keeping their toilets! Now they, the AT&TT, have a choice. They can peacefully leave the county without any toilets or they may sit in the county jail. It is their choice. “We the people” need to keep in mind that we have a duty to support the Sheriff in the execution of his duty. We need to ‘have his back’. He needs to know that he does not stand alone; that we are standing with him to protect our God given rights as outlined in the Constitution and Bill of Rights. It does not matter what entity comes to violate the rights of the people of the county; whether they be private individuals committing the crime or representatives of some Federal, State, International, or Local government agency. A crime is a crime regardless of what form or color of law the perpetrator may bear. It remains the Sheriff’s duty to work for the people! To “Protect and defend” the Constitution! They swear an Oath to do just that! We need sheriffs in every county that understand their duty and have the intestinal fortitude to follow through and uphold their Oath to the Constitution. The National Sheriff Association booklet: The Role of the Sheriff, Past-Present-Future made the following observation: “(The sheriffs are) vested with the powers and duties possessed by their predecessors under common law.” Neither a legislature nor a court of law possesses any legal authority to strip a sheriff of these common law powers. They may assign him additional duties, provided they do not infringe or violate any of his Constitutional duties which he has sworn to defend and protect. Another common law power inherent in the sheriffs duty is the ability to call forth the posse comitatus. Historically, this was referred to as “The hue and cry”. This power required all who were within earshot of the sheriffs beckoning call to come forth to his aid. After the Brady Bill was passed into law, the BATF (Bureau of Alcohol, Tobacco and Firearms) sent letters to the Sheriffs which explained to them, their newly enacted (Unconstitutional) functions. In these letters, the BATF referred to the Sheriffs as the CLEO’s which stands for “CHIEF LAW ENFORCEMENT OFFICER”. Yes even the Federal Government recognizes the power of the Sheriff! Well perhaps only when it is convenient to them. The sheriffs of this great nation are in danger of losing their power. This comes as a result of the apathy and ignorance of the population at large and the ignorance of many sheriffs regarding the Constitutional Oath they swore and the common law powers they possess. According to The National Sheriffs Association,“Sheriffs can maneuver through court battles involving a challenge to their authority and come out successfully when they address the legal protections of their office concerning their Constitutional obligations, and no legal system or authority in the United States can challenge it with any legal standing.” The key statement in this quote is “when they address the legal protection of their office concerning their Constitutional obligations.” How many sheriffs understand the Oath to which they swore? This Oath placed them under obligation to uphold and defend the Constitution of the United States. How many have studied the Constitution enough to clearly understand their obligation? The following examples illustrate the nature of the dangers our sheriffs are faced with. Unfortunately, the sheriffs in these examples have already fallen prey to the “powers that think they are” and will answer to them instead of “We the People”. In the following cases, the elected protectorate, the sheriff, has been illegally taken from the local control of the people and placed in a foreign jurisdiction which is incompatible with their original duties. In Salt Lake County, the new year of 2010 started with the sheriffs department being swallowed up by the new Unified Police Department. The sheriff now sits as the CEO of this new department but he has given up his power and control over all financial and policy decisions to a board of directors. Is it possible that this board of directors could tie the sheriffs hands and prevent him from performing his oath sworn Constitutional duty? This is a prime example of the sheriff and the people to whom he should answer, ignorantly allowing the sheriffs powers to be stripped away. You can read the article about this at Deseret News.com. In Massachusetts, an even worse tragedy has occurred. On January 1st of 2010, the seven remaining independent county sheriff departments (what happened to the previous departments?) were placed under the jurisdiction of the State. This came as a result of legislation introduced by the governor which was consequently passed with ease in both houses of the Massachusetts legislature. Of course it was done under the guise of saving tax payers money and it had the support of their county sheriffs departments and the Massachusetts Sheriffs Association. Does the Governor, or the Legislature really have the power to co-opt the autonomous County Sheriffs Department? I answer NO! By doing this, they have usurped the Constitutional, common law power of the people as provided in their original compact of local government. You can read the praise which this decision received in the publication Cape Cod Today. These previous instances prove that “we the people” need to be awake, alert, educated and active. Likewise, we need to help awaken others, so we can effectively prevent these usurpations from happening and if they have already happened we need to remedy the situations and restore our sheriffs to their proper positions. Despite the previous examples and numerous court cases which have unlawfully eroded the powers of the sheriff, there is good news to be found. In 1994, the Supreme Court of Pennsylvania decided a case which reinforced the original power of the sheriff. You can read the entire decision here. Following are a few of the important quotes. In another case brought before the Supreme Court of the United States and decided in the year 1997, we find the fact reiterated that the county sheriffs do not work for the Federal Government. This decision also reinforced the fact that the state governments are separate and independent sovereign jurisdictions and thus are “not subject to federal direction.” Justice Scalia writing for the majority stated that “The Federal Government may not compel the states to enact or enforce a federal regulatory program.” I wonder if the Governors of the states know this! Justice Scalia included the following quote from James Madison in this decision. The Canada Free Press did an excellent overview of this court decision in their March 22, 2009 edition. Read it here. You can read the entire Supreme Court decision here. Both litigants, Sheriff Printz of Montana and Sheriff Mack of Arizona need to be applauded for standing up against the usurpations of their power. We need to understand that when their power has been usurped, so has ours! Besides the previous examples which went to court, Sheriff Mack and other sheriffs have been bravely standing up for that which is right.The following account comes from an article written by Alan Stang in News With Views.Com. “While Richard Mack was sheriff of Graham County, Arizona, a bridge washed out. Parents had to drive twenty six miles to get their kids to school half a mile across the river. But the U.S. Army Corps of Engineers wouldn’t fix it. First they had to do an “environmental impact study,” to replace a bridge already there. They were in no hurry. The study would take a mere ten years. The next two examples are taken from Sheriff Macks book County Sheriff, America’s Last Hope. In February of 2010, a brave Colorado sheriff who understood his power and duty, stood up against the recently implemented gun ban at Colorado State University. Thank you Sheriff Alderden for taking a stand! The people do have an inherent right to defend themselves against dangerous aggressors! You can read more about this occurrence in the Colorado Springs Gazette. This legislation has since been used as a model and has been introduced in several other state legislatures. Namely, the states of Alabama, Tennessee and Washington. To learn more and keep up to date with the progress of this important effort, please visit the Tenth Amendment Center. Please become involved in this effort to restore the supremacy of the Constitution of the United States within the borders of your county and state. It is important that your God given rights, which have been recognized and declared in the Bill of Rights, receive the full protection of law, which your duly elected sheriff is oath bound to obey. Get to know your sheriff. If needs be educate him by sharing with him articles, stories or books about the proper role of the sheriff. Share with him this overview of his powers and duties. Don’t overwhelm him with too much at once. Talk to your legislatures about introducing or supporting legislation like the Montana House Bill 284 which reinforces the sheriffs proper powers within his jurisdiction. Give them copies of Sheriff Macks book County Sheriff, America’s Last Hope . Start a web site and or a local group of concerned citizens to assist with this effort. The same person chewing on your sheriffs ear will not be nearly as effective as a large group of concerned citizens. Finally, If or when your sheriff needs to draw that proverbial line in the sand, he will not want to be alone holding that line. He will act much more confidently and courageously when he knows that we are willing to stand with him. Lets do our part to preserve Liberty for ourselves and future generations! TheButler County Sheriff Brigade is a local group of men and women who are offering their support and assistance to the sheriff. The group is active in getting to know the sheriff and his deputies. They help the sheriff learn about Constitutional principles and his power and duty under the common law. They are also active in attending County Commissioner meetings and writing letters to the Editor of local papers. Their purpose is to promote Constitutional government in the county and to give popular support to the sheriff. Ultimately, we as a group are working towards becoming better prepared to come to the aid of our sheriff when he makes the call. This entry was posted in Government, Localization and tagged constitution, county, localization, Mack, sheriff. Bookmark the permalink.